(HealthDay News) — Focal laser ablation (FLA) of low- to intermediate-risk prostate cancer is associated with low morbidity and good oncologic outcomes, according to a study published in the March issue of the Journal of Vascular and Interventional Radiology. Eric Walser, MD, from the University of Texas Medical Branch in Galveston, and colleagues conducted transrectal FLA in 120 patients with low-risk to intermediate-risk prostate cancer. Ablation was controlled by magnetic resonance imaging (MRI) thermometry. 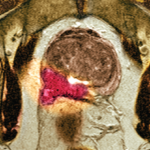 At 6 and 12 months, clinical and MRI follow-up was performed with biopsy of suspicious areas. Sexual and urinary function were surveyed. The researchers found that 30.8, 46.7, and 22.5% of patients had a Gleason score of 3+3=6, 3+4=7, and 4+3=7, respectively. Tumor stage was T1c, T2a, and T2b in 74.2, 21.7, and 4.2% of patients, respectively. Seventeen percent of patients had additional oncologic therapy one year after FLA when cancer was confirmed by biopsy following abnormal MRI. No difference was seen in functional scores before and after ablation. At 12 months, median prostate-specific antigen levels decreased significantly to 3.25. The only significant predictor for positive MRI after treatment was tumor diameter above the median (odds ratio, 3.36). Walser E, Nance A, Ynalvez L, et al. Focal Laser Ablation of Prostate Cancer: Results in 120 Patients with Low- to Intermediate-Risk Disease. J Vasc Interv Radiol.